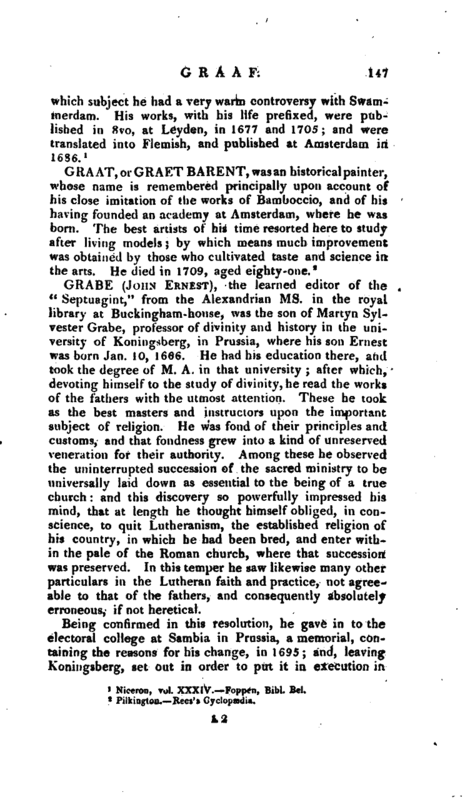 , the learned editor of the “Septuagint,” from the Alexandrian ms. in the royal library at Buckingham-house, was the son of Martyn Sylvester Grabe, professor of divinity and history in the university of Koningsberg, in Prussia, where his son Ernest was borti Jan. 10, 1666. He had his education there, and took the degree of M. A. in that university; after which, devoting himself to the study of divinity, he read the works of the fathers with the utmost attention. These he took as the best masters and instructors upon the important subject of religion. He was fond of their principles and customs, and that fondness grew into a kind of unreserved veneration for their authority. Among these he observed the uninterrupted succession of the sacred ministry to be universally laid down as essential to the being of a true church: and this discovery so powerfully impressed his mind, that at length he thought himself obliged, in conscience, to quit Lutheranism, the established religion of his country, in which he had been bred, and enter within the pale of the Roman ctyurch, where that succession was preserved. In this temper he saw likewise many other particulars in the Lutheran faith and practice, not agreeable to that of the fathers, and consequently absolutely erroneous, if not heretical. Being confirmed in this resolution, he gave in to the electoral college at Sambia in Prussia, a memorial, containing the reasons for his change, in 1695; and, leaving Koningsberg, set out in order to put it in execution in | some catholic country. He was in the road to Erfurt in this design, when there were presented to him three tracts in answer to his memorial, from the elector of Brandenburgh, who had given immediate orders to three Prussian? divines to write them for the purpose. The names of these divines were Philip James Spener, Bernard Van Sanden, and John William Baier. The first was ecclesiastical counsellor to the elector, and principal minister at Berlin; and the second principal professor at Koningsberg. The three answers were printed the same year: the first at Berlin, the second at Koningsberg, both in 4to, and the third at Jana, in 8vo. 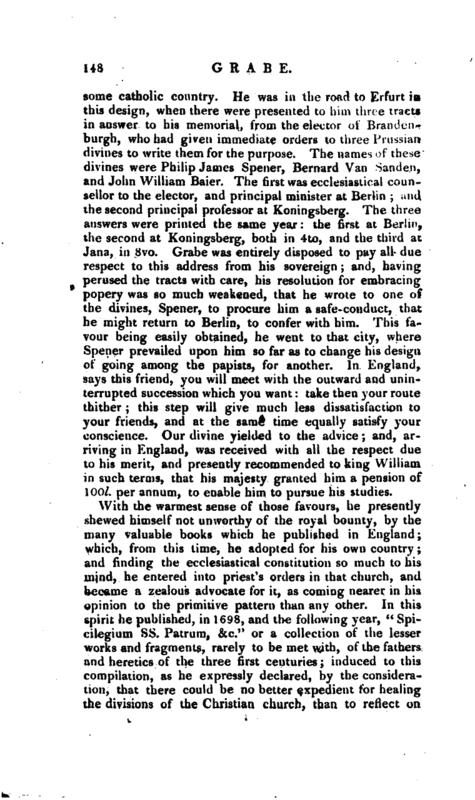 Grabe was entirely disposed to pay all due respect to this address from his sovereign; and, having perused the tracts with care, his resolution for embracing popery was so much weakened, that he wrote to one of the divines, Spener, to procure him a safe-conduct, that he might return to Berlin, to confer with him. This favour being easily obtained, he went to that city, where Spener prevailed upon him so far as to change his design, of going among the papists, for another. In England, says this friend, you will meet with the outward and uninterrupted succession which you want take then your route thither this step will give much less dissatisfaction to your friends, and at the same time equally satisfy your conscience. Our divine yielded to the advice; and, arriving in England, was received with all the respect due to his merit, and presently recommended to king William in such terms, that his majesty granted him a pension of 100l. per annum, to enable him to pursue his studies. With the warmest sense of those favours, he presently shewed himself not unworthy of the royal bounty, by the many valuable books which he published in England which, from this time, he adopted for his own country and finding the ecclesiastical constitution so much to his mind, he entered into priest’s orders in that church, and became a zealous advocate for it, as coming nearer in his opinion to the primitive pattern than any other. In this spirit he published, in 1698, and the following year, “Spicilegium Ss. Patrum, &c.” or a collection of the lesser works and fragments, rarely to be met with, of the fathers and heretics of the three first centuries; induced to this compilation, as he expressly declared, by the consideration, that there could be no better expedient for healing the divisions of the Christian, church, than to reflect on | the practice and opinions of the primitive fathers. Both these volumes were reprinted at Oxford in 1700, 8vo, and some remarks were made upon the first in a piece entitled “A new and full method of settling the Canonical Authority of the New Testament, by Jer. Jones, 1726,” 8vo. From the same motive he printed also Justin Martyr’s “First Apology” in 1700; and the works of Irenaeus in 1702; both which were animadverted upon by Thirlby, the editor of Justin Martyr, and Massuet, the editor of Irenaeus. Upon the accession of queen Anne to the throne this year, besides continuing his pension, her majesty sought an occasion of giving some farther proofs of her special regard for him; and she was not long in rinding one. The “Septuagint” had never been entirely printed from the Alexandrian ms. in St. James’s library, partly owing to the great difficulty ef performing it in a manner suitable to its real worth, and partly because that worth itself had been so much questioned by the advocates of the Roman copy, that it was even grown into some neglect. To perform this task, and to assert its superior merit, was an honour marked out for Grabe; and when her majesty acquainted him with it, she at the same time presented him with a purse of 60l. by the suggestion of her minister Harley, to enable him to go through with it. This was a most arduous undertaking, and he spared no pains to complete it. In the mean time he employed such hours as were necessary for refreshment, in other works of principal esteem. In 1705 he gave a beautiful edition of bishop Bull’s works, in folio, with notes; for which he received the author’s particular thanks; and he had also a hand in preparing for the press archdeacon Gregory’s edition of the New Testament in Greek, which was printed the same year at Oxford, revising the scholia, which Gregory, then dead, had collected from various authors, and making the proper references. From his first arrival he had resided a great part of his time in that university, with which he was exceedingly delighted. Besides the Bodleian library there, he met with several persons of the first class of learning in theological and sacred criticism, among whom he found that freedom of conversation and communication of studies which is inseparable from true scholars; but still the Alexandrian ms. was the chief object of his labour. He examined it with his usual diligence, and coniparing it with a copy | from that of the Vatican at Rome, he found it in so many places preferable to the other, that he resolved to print it as soon as possible. With this view, in 170^, he drew up a particular account of the preferences of this to the Vatican ms. especially in respect to the book of “Judges,” and published it, together with three specimens, containing so many different methods of his intended edition, wishing to be determined in his choice by the learned. This came out in 1705, with proposals for printing it by subscription, in a letter addressed to Dr. Mill, principal of Edmund-hall, Oxford; and that nothing might be wanting which lay in the power of that learned body to promote the work, he was honoured with the degree of D. D. early the following year, upon which occasion Dr. Smalridge, who then officiated as regius professor, delivered two Latin speeches, containing the highest compliments to his merit. The success was abundantly answerable to his fondest wishes: besides the queen’s bounty, he received another present from his own sovereign the king of Prussia; and subscriptions from the principal nobility, clergy, and gentry, crowded daily upon him from all parts. In the midst of these encouragements, the first volume of this important work came out in 1707, at Oxford, in folio and bvo. This volume contained the Octateuch, and his design was to print the rest, according to the tenor of the ms. but, for want of some materials to complete the historical and prophetical books, he chose rather to change that order, and to expedite the workjis much as possible. The chief materials for which he waited not yet coming to hand, he was sensible that the world might expect to see the reasons of the delay, and therefore published a dissertation the following year, giving a particular account of it, under the title of “Dissertatio de variis vims LXX Interpretum ante B. Origenis yevum illatis, & remediis ab ipso Hexaplari ejusdem versionis additione adhibitis, deque hujus editionis reliquiis tam mannscriptis tarn praelo excusis.” The helps he wanted, as above intimated, were a Svriac ms. of the historical books of the Old Testament, 'with Origen’s marks upon them; besides two Mss. one belonging to cardinal Chigi, and the other to the college of Lewis le Grand. He received all afterwards, and made collations from them, as also for a volume of annotations upon the whole work, as well as for the prolegomena; all which requiring some time to digest into a proper method, the | second volume did not come out till 1719, when the fourth also appeared, and was followed by the third the ensuing year. This piece was printed at Oxford, 1711, 8vo. 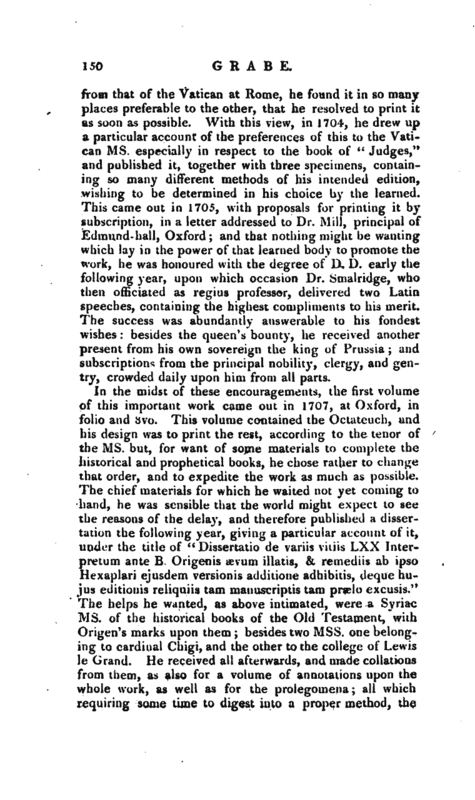 In the dedication, he observes, that it was the first piece which he published in the English tongue, for the service of the church, He was assisted in it by Gagnier, who, about ten years before, had come over to the church of England from that of France, and then taught Hebrew at Oxford; and, being well skilled in most of the Oriental languages, had been appointed the year before, by Sharp, archbishop of York, to assist Grabe in perusing these Mss. having engaged the doctor to write this treatise against Whiston’s notion. 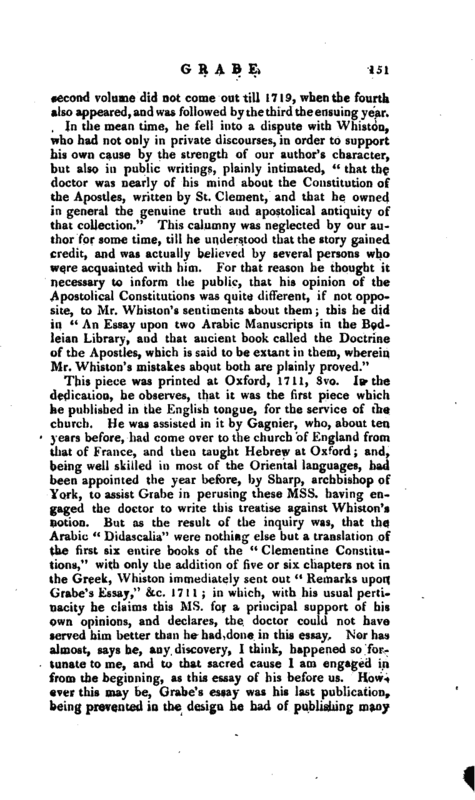 But as the result of the inquiry was, that the Arabic “Didascalia” were nothing else but a translation of the first six entire books of the “Clementine Constitutions,” with only the addition of five or six chapters not in the Greek, Whiston immediately sent out “Remarks upon Grabe’s Essay,” &c. 1711 in which, with his usual pertinacity he claims this ms. for a principal support of his own opinions, and declares, the doctor could not have served him better than he had done in this essay. Nor has almost, says he, any discovery, I think, happened so fortunate to me, and to that sacred cause I am engaged in from the beginning, as this essay of his before us. 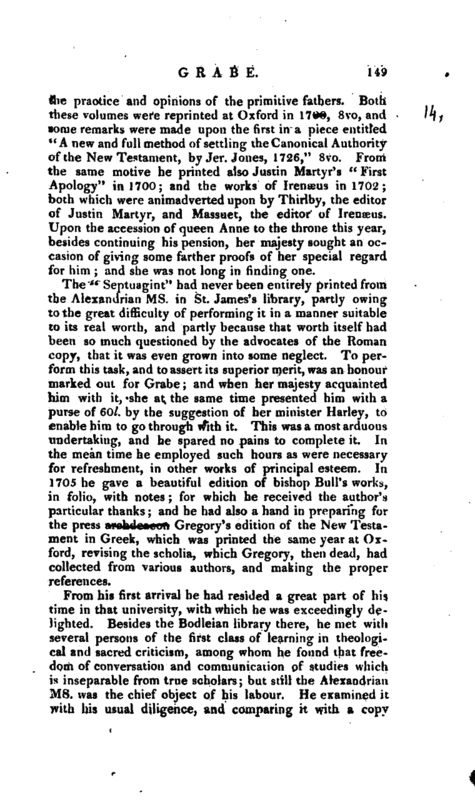 However this may be, Grabe’s essay was his last publication, being prevented in the design he had of publishing many | others by his death, which happened Nov. 12, 1712, in the vigour of his age. He was interred in Westminsterabbey, where a marble monument, with his effigy at full length, in a sitting posture, and a suitable inscription underneath, was erected at the expence of the lord-treasurer Harley. He was attended in his last illness by Dr. Smalridge, who gave ample testimony of his sincere piety, and fully refuted the aspersions cast on his moral character by Casimir Oudin. He desired upon his death-bed that his dying in the faith and communion of the church of England might be made public. He thought it a sound and pure part of the catholic church, notwithstanding some defects which he thought he perceived in the reformation. He expressed also his most hearty wishes for the union of all Christians, according to the primitive and perfect model. He was, however, a little scrupulous about communicating publicly in the English church, at least unless he could place an entire confidence in the priest that was to officiate, or except in case of necessity. Yet, with all these scruples, which in our days will not be clearly understood, he always professed more esteem for the church of England than for any other part of the catholic church. He had so great a zeal for promoting the ancient government and discipline of the church, among all those who had separated themselves from the corruption and superstitions of the church of Rome, that he formed a plan, and made some advances in it, for restoring the episcopal order and office in the territories of the king of Prussia, his sovereign; and he proposed, moreover, to introduce a liturgy much after the model of the English service, into that king’s dominions. He recommended likewise the use of the English liturgy itself, by means of some of his friends, to a certain neighbouring court. By these methods, his intention was to unite the two main bodies of Protestants in a more perfect and apostolical reformation than that upon which either of them then stood, and thereby fortify the common cause of their protestation against the errors of popery, against which he left several Mss. finished and unfinished, in Latin, of which the tithes in English are to be found in Dr. Hickes’s account of his Mss. Among these also were several letters, which he wrote with success to several persons, to prevent their apostacy to the churcll of Rome, when they were ready to be reconciled to it; nnd in his letters he challenged the priests to meet him in | conferences before the persons whom they had led astray; but they knowing, says Dr. Hickes, the Hercules with whom they must have conflicted, wisely declined the challenge. He left a great number of Mss. behind him, which he bequeathed to Dr. Hickes for his life, and after his decease to Dr. George Smalridge. 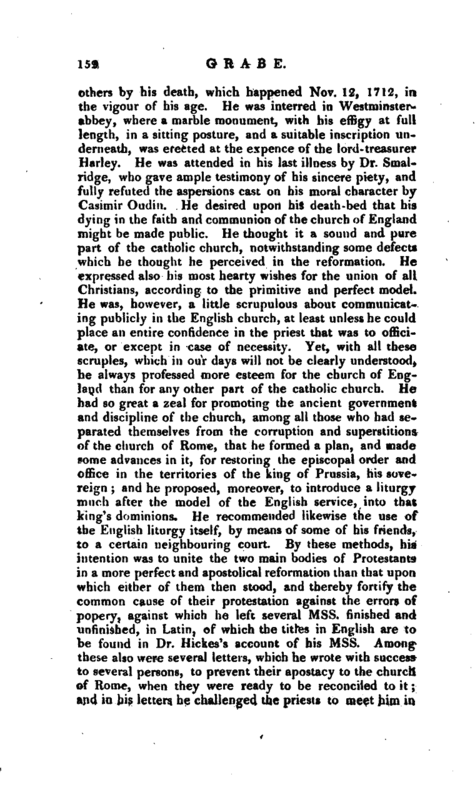 The former of these divines carefully performed his request of making it known, that he had died in the faith and communion of the church of England, in an account of his life, prefixed to a tract of our author’s, which he published with the following title “Some Instances of the Defects and Omissions in Mr, Whiston’s Collections of Testimonies, from the Scriptures and the Fathers, against the true Deity of the Holy Ghost, and of misapplying and misinterpreting divers of them, by Dr. Grabe. To which is premised, a discourse, wherein some account is given of the learned doctor, and his Mss. and of this short treatise found among his English Mss. by George Hickes, D. D.” 1712, 8vo. There came out afterwards two more of our author’s posthumous pieces I “Liturgia Grseca Johannis Ernesti Grabii.” This liturgy, drawn up by our author for his own private use, was published by Christopher Matthew Pfaff, at the end of “Irensei Fragmenta Anecdota,” printed at the Hague, 1715, 8vo. 2. “De Forma Consecrationis Eucharistiae, hoc est, Defensio Ecclesia? 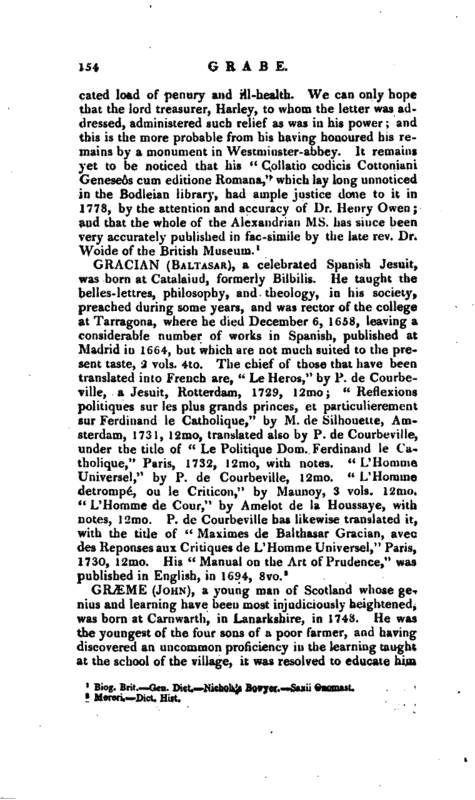 Griccae,” &c. i. e. “A Discourse concerning the Form of Consecration of the Eucharist, or a defence of the Greek church against that of Rome, in the article of consecrating the Eucharistical Elements; written in Latin, by John Ernest Grabe, and now first published with an English version.” To which is added, from the same author’s Mss. some notes concerning the oblation of the body and blood of Christ, with the form and effect of the eucharistical consecration, and two fragments of a preface designed for a new edition of the first liturgy of Edward VI. 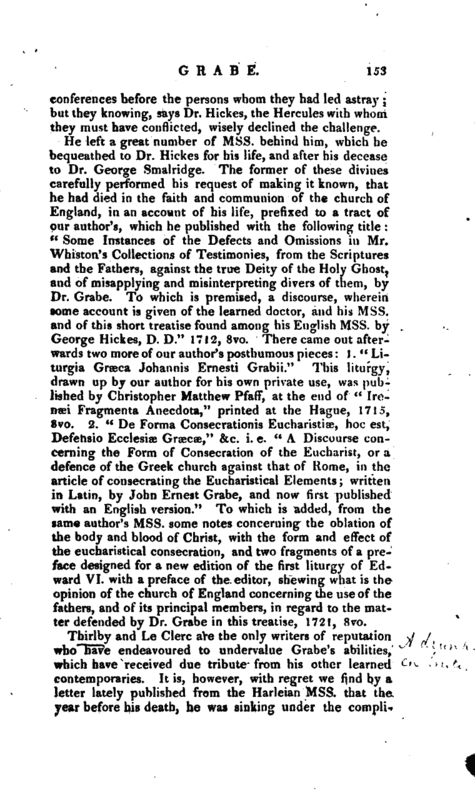 with a preface of the editor, shewing what is the opinion of the church of England concerning the use of the fathers, and of its principal members, in regard to the matter defended by Dr. Grabe in this treatise, 1721, 8vo. Biog. Brit. Gen. Dict. Nicholas Bowyer. —Saxii Onomast.